Director: John Huston. Cast: José Ferrer, Suzanne Flon, Colette Marchand, Zsa Zsa Gabor, Claude Nollier, Katherine Kath, Muriel Smith, Lee Montague, Peter Cushing, Theodore Bikel, Mary Clare. Screenplay: John Huston and Anthony Veiller (based on the novel by Pierre La Mure). Twitter Capsule: Toulouse Lautrec may have found the art in garishness. Huston, Ferrer, and Company make the opposite discovery here. VOR: ② Interesting to see Huston exploring color. I guess from a standpoint of production design, this is semi-lavish. But it's also a dingy puddle of the worst biopic clichés. José Ferrer, the Geoffrey Rush of his era, had an incorrigible weakness for playing social grotesques, weird poet-sages whose physical and psychic blemishes made them either foolish ugly ducklings or irritating misanthropes. Within that tradition, Moulin Rouge is sort of the ultimate José Ferrer picture, because as Henri de Toulouse-Lautrec he gets to be all these things at one time: gifted artist, pitiable cripple, sad alcoholic, font of florid aphorisms, filial embarrassment, social iconoclast, pariah of love, and poisonous cynic with an alleged albeit very well-hidden romantic core. It's hard to imagine the role or the actor who could withstand the weight of all these different conceptions. Certainly Ferrer, ambling around on his knees to play the famous midget, is both too small and too large an actor to cut the moutarde. I'm not sure it ever occurred to Ferrer in his entire career to approach a role with anything but the utmost sincerity; his range, from what I've seen, is pretty limited to the hot self-hatred of self-styled genius. (He won an Oscar as Cyrano de Bergerac, which probably set the typecasting in motion.) 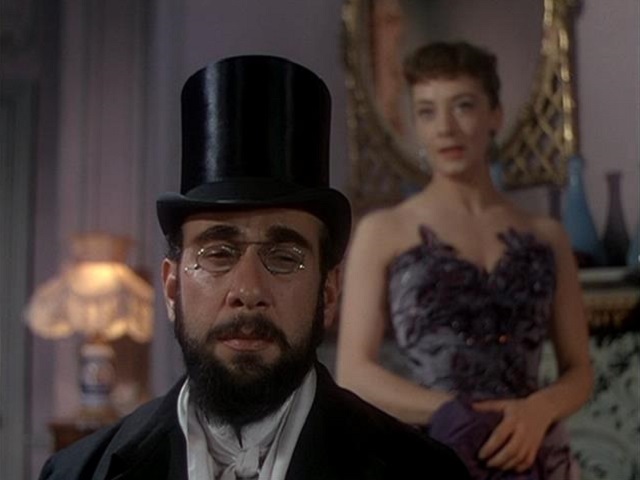 Within this limited range of emotion, Ferrer goes shockingly over the top, failing to disguise that his frequent pontifications are anything but wretchedly written dialogue, yet fully disclosing that he believes the entire burden of every downtrodden bohemian's weary soul to rest on his four-foot-high shoulders. Misguided self-importance is pretty much the name of the game in this flaming piece of crapola, as it so often is in Hollywood's painter biopics (viz. everything from The Agony and the Ecstasy to Surviving Picasso). The director, John Huston, was one of Hollywood's most famous procrastinators: he finished editing on 1951's The African Queen only days before its public premiere, and outdid even himself by completing Moulin Rouge's final cut only hours in time for the December 1952 debut required for eligibility in that year's Oscar race. That Moulin Rouge actually scored seven major nods, including Picture, Director, and Actor honors, therefore represents both a nick-of-time victory and a definitive proof that Academy voters will often endorse anything if they think they're getting brand-name stuff. Truth is that Moulin Rouge is one of those Huston films that, whether or not because of rushed production, shows just how off the mark its erratic director could go. The first half-hour or so dedicates itself to the flamboyant colors, leering gazes, and frou-frou skirts of the infamous club, though even the more vivid shots in these opening sequences are now forever doomed to comparative dimness next to Baz Luhrmann's delirious 2001 Moulin Rouge. Still, the mid-level enthusiasm Huston manages to conjure up for some can-can dancingor, failing actual dancing, hair-pulling and cat-fighting among the erstwhile chorinesis still infinitely preferable to the torturous story that follows of Toulouse's pathetic "love affair" with Marie Charlet (Colette Marchand), a low-class vamp who buys dresses with his money but leaves him waiting up night after night until he finally locks his door against her. When did Hollywood decide that artists were only interesting as failed paramours? At what exact juncture did it become necessary for every story to anchor itself in a love story, whether abject or exquisite? The union of Marie and Toulouse isn't convincing even as a one-night collision of desperate people, much less as the traumatic episode that Huston's screenplay credits as the inspiration for much of Toulouse's art. The painter's later involvement with a much more interesting, mature, and largely self-supporting woman named Myriamme Hirman holds much more interest, if only because Suzanne Flon is a much more serene actress than the fussy, grandstanding Marchand. Nevertheless, that plotline, like so many others, fizzles to nothing, and the film seems as bored and listless as the viewer has doubtless become. Huston treats us to slideshows of Toulouse-Lautrec's sketches, a soused appearance at a major gallery show, and even a few hallucinated dance numbers before this movie finally gives up its permanent distraction from itself. It is sad to report that the technical artists were hardly more attentive than the actors or the auteur overseeing them. Ralph Kemplen's editing, Oscar-nominated though it may have been, is often laughably crude: a dissolve out of a conversation between Toulouse and Myriamme cannot quite hide the fact that Myriamme is still talking, the rest of her conversation apparently not worthy of our hearing. (Was it really more tin-eared than the rest of this script?) The casting directors tickled themselves by hiring parents for Ferrer's character who are obviously his own age, and stand-ins for Toulouse whose fully-grown legs cannot be disguised even by the most deliberately placed props or high-angle camera shots. Even the script's conceit for why Toulouse was so shorthis broken legs never properly healed or grew after a fall down the stairs as an adolescentcompletely fails to persuade. The pre-teen actor impersonating the would-be artist stands head and shoulders over Ferrer; certainly breaking one's legs doesn't make them shorter? !